The information below highlights the drought management efforts currently underway in Manitoba. The Manitoba Drought Management Strategy provides an overarching framework and action strategies for an integrated approach to minimize the impacts of drought on Manitoba's people, economy and environmental resources. Monitoring and reporting are key to drought management. Up to date information on water availability and drought conditions is accessible below, while our suite of drought indicators can be viewed interactively on the Drought Indicator Map. We are working to better understand the impacts of drought on Manitobans and to build our resiliency through increased drought preparedness. Have you seen drought impacts on your area? Let us know! Please send us an email at drought@gov.mb.ca. Additional information, including as links to various resources, can be found in the Resources and Contacts tab. The Manitoba Drought Management Strategy provides a framework for an integrated approach to managing drought, with the goal of minimizing the environmental, social and economic impacts of drought on Manitoba’s residents, economy and environmental resources. The Manitoba Drought Management Strategy provides a history and overview of drought on the Canadian Prairies, defines science-based indicators to characterize drought conditions, and outlines strategies to improve communication, coordination, and response to drought and increase Manitoba’s drought preparedness. Please refer to the strategy for more details. This Water Availability and Drought Conditions Report provides an update on drought conditions throughout Manitoba for October 2018. In October, the majority of the province observed normal (85 to 115 % of median) or above normal (> 115 % of median) precipitation. The region surrounding Swan River experienced extremely dry (< 40 % of median) conditions, with moderately dry (60 to 85 % of median) conditions extending northward to Flin Flon. Moderately dry conditions also occurred within the south Interlake region, and the area surrounding Island Lake. Portions of northern Manitoba saw conditions ranging from moderately to extremely dry. Over the past three months, much of Manitoba observed normal precipitation. Regions of moderately dry conditions included most of southwest and northwest agro-Manitoba and a region extending northwest from Swan River to The Pas and Norway House. Russell and Grandview were severely (40 to 60 % of median) dry. Over the past 12 months, most of southern Manitoba and the region surrounding Churchill observed moderately dry conditions, with pockets of severely dry conditions. The remainder of the province experienced normal or above normal precipitation conditions during this period. As of November 1, 2018, below normal (10th - 25th percentile) or much below normal (< 10th percentile) streamflows were observed on the Mossy, Souris, Whiteshell, Kettle and Hayes rivers. Below normal (14th percentile) water levels were observed on Lake Manitoba. Groundwater levels in major aquifers are generally in the normal range. Water levels in the Carbonate Aquifer near Anola continued to be below normal (10th - 25th percentile), but have been steadily increasing since mid-October. The Canadian Drought Monitor has downgraded the severity of drought conditions in southern Manitoba since the September 30, 2018 assessment by removing all pockets of D2 (severe drought). Southwest and central agro-Manitoba are now classified as D1 (moderate drought), with the remainder of agro-Manitoba classified as D0 (abnormally dry). There are currently no major concerns over reservoir water supplies. 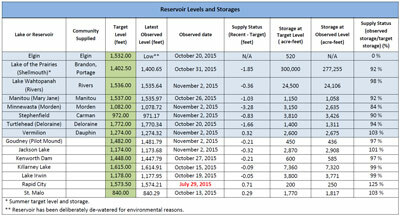 However, a few reservoirs such as Stephenfield Reservoir and Jackson Lake continue to be closely monitored due to below normal levels for this time of year. Manitoba Agriculture stated that dugout levels are generally very low across most of agro-Manitoba. Funding for producers is now available for water source development projects through Ag Action Manitoba – Assurance: Beneficial Management Practices. Manitoba Agriculture is reminding livestock producers that there are provincial services available to help manage feed shortages. Producers can contact Manitoba Agriculture toll-free at 1-844-769-6224 or visit www.gov.mb.ca/agriculture for more information. Environment and Climate Change Canada’s seasonal forecast for November-December-January projects temperatures to be above normal and precipitation to be normal. The Surface Water Management Section of Sustainable Development provides updates on water availability and drought conditions. Please see below to access the most recent and historical reports. All drought conditions maps will be updated regularly throughout the open water season. During the winter months, only the Canadian and U.S. Drought Monitor map will continue to be updated on a monthly basis. In the last 100 years, geographically extensive, multi-year droughts with severe impacts were observed in the 1930s, 1960s, 1980s, and most recently in the early 2000s. In fact, according to the Institute for Catastrophic Loss Reduction's Canadians at Risk report (2010)1, droughts are responsible for five out of the top ten most expensive Canadian natural disasters on record. 1 Institute for Catastrophic Loss Reduction (ICLR). 2010. Canadians at Risk: Our exposure to natural hazards. Although not as well documented as the droughts of the 1900s, there were also many severe droughts that occurred in the 1800s. The Institute for Catastrophic Loss Reduction (Institute for Catastrophic Loss Reduction, 2010)1 lists impacts such as scorched potato crops in the Red River Valley in 1805, continuous drought and hordes of grasshoppers across the prairies from 1816 to 1819, complete failure on the 1846 crop in the Red River Valley, crop failures and grasshopper plague in 1868, and nine years of continuous drought across the prairies in the 1890s. Although droughts in the latter half of the 19th century may have been more severe in some areas, the drought of the 1930s was the drought with the largest impact on Manitoba and the Canadian Prairies. The drought set in during 1929 and prevailed through to the early 1940s. The drought of the 1930s was made famous by massive dust storms which earned the decade the nickname "the dirty thirties". The multi-year severe drought, combined with the 1929 stock market crash, led to devastating socioeconomic conditions on the prairies. Blowing dust and significantly reduced crop production occurred from the early 1930s to 1939. By the mid-1930s the drought was set in across the North American prairies, including across the Canadian Prairies and south all the way to Texas in the U.S.A. Poor soil conservation and farming practices contributed to the soil conditions that allowed the dust storms to reach extraordinary proportions. Crop disease and grasshopper infestations added to the agricultural devastation. With low prices for cattle and lack of feed, conditions forced producers to reduce cattle herds by selling at low prices, or in some cases, culling portions of their herd with no return. The 1936 census indicates that 500 farms were abandoned in Manitoba (Dean et al., 1998)2. Lack of social programs and crop insurance combined with the poor economic conditions exacerbated many socioeconomic drought impacts. The dust and lack of water also caused health impacts on people, livestock, and wildlife. "Dust pneumonia" and other respiratory illnesses caused many deaths. Failed crops and economic instability of farming operations created severe mental stress for farming families which led to increased suicide rates. Drought conditions finally began to ease in the early 1940s. The Prairie Farm Rehabilitation Administration (PFRA) was established in 1935 by the Federal Government of Canada as a Branch of Agriculture and Agri-food Canada. PFRA's mandate was to mitigate and recover from the drought by delivering various programs on soil erosion and on-farm water supply to support famers and agricultural industries. 2 Dean, William G.; Conrad Heidenreich; and Thomas McIlwraith. 1998. Concise Historical Atlas of Canada. University of Toronto Press. The drought of the early 1960s was not as long in duration as the drought of the 1930s but was one of the most severe droughts on record. In June 1961 there were record low rainfall accumulations coinciding with record mean monthly temperature and bright sunshine hours. Conditions led to wide scale crop failures and famers selling off cattle due to lack of feed and water. Drought conditions in many locations were worse than conditions in the 1930s. Dust storms were prevalent reminding people of the great dust bowl of the 1930s. Although moderate droughts were reported throughout the 1960s, widespread severe drought was limited to 1961. The return of widespread severe drought occurred in the 1980s. The drought had significant economic impacts in Manitoba. The drought peaked in severity in 1988 causing agricultural production in Manitoba to reduce to 60% of average. There was also an $80 million dollar loss in hydro power exports in 1989 (Simard and Joyce, 2005)3. Loss of wetland habitat and increase incidence of disease had a negative impact on waterfowl populations and associated recreation opportunities. Despite the severity of impacts, conditions could have been worse if drought preparedness had not been improved since the 1930s. Lessons on soil conservation had been learned from the 1930s and measures such as new tillage techniques, and treed shelter belts greatly reduced the potential for wind erosion of soils. Crop insurance and government subsidies were helpful to reduce socioeconomic impacts. 1988 drought, near Pipestone (TWP 6-RGE 26), Manitoba, June, 1988 (Courtesy: Agriculture and Agri-food Canada). 3 Simard, T.J., and J. R. Joyce. 2005. Manitoba Hydro: 2002-2004 Drought Risk Management Review. The drought that occurred from 1999 to the mid-2000s was a severe multiyear drought that covered a large portion of the Canadian Prairies. It is the drought of record in some areas of Alberta. The drought had impacts across the prairies on agriculture, tourism, health, hydro power generation, and forestry. The Canadian gross domestic product lost $5.8 billion dollars for 2001 and 2002 due to the drought and more than 41,000 jobs were lost (Lawford et al., 2008)4. There was a $3.6 billion dollar reduction in agricultural production in the 2001/2002 fiscal year (Lawford et al., 2008)4. The drought also led to a dramatic increase in forest fires and numerous massive dust storms were reported. In fiscal year 2003/04, Manitoba Hydro incurred the largest financial loss in its history of $436 million due to reduced flow in its system (Manitoba Hydro-Electric Board, 2004)5. Spilt Lake, Nelson River Basin, June, 2003 (Courtesy: Manitoba Hydro). 4 Lawford, Rick, Harvey Hill, Elaine Wheaton, Irene Hanuta, Alf Warkentin and Bill Girling. 2008. User Expectations for the Drought Research Initiative (DRI). Canadian Meteorological and Oceanographic Society Bulletin. Vol. 36, No 3. 5 Manitoba Hydro-Electric Board. 2004. Manitoba Hydro-Electric Board 53rd Annual Report. Drought conditions quickly developed across Manitoba in 2012 after widespread flooding that occurred in 2011. Although short in duration, drought impacts were already noticeable as pasture productivity was reduced and many dugout supplies were inadequate for livestock operations. Wildfires broke out in May near the communities of Badger and Vita leading to the declaration of local states of emergency. In October more wildfires occurred in southeast Manitoba and the Interlake. In the October fires two states of local emergency were declared, approximately 270 people were evacuated including the communities of Vita and Ross, and 14 homes or farm operations were damaged. In 2015 drought conditions, warm temperatures and increased winds resulted in extreme wildland fire risk across western Canada. The number of fires per day significantly increased by the end of June, and the fire situation continued to escalate through most of July. Saskatchewan incurred the largest burned area, followed by the Northwest Territories and Alberta. Thousands were forced to evacuate their homes, and the number of Canadian agencies impacted by wildland fire activity during this period resulted in unprecedented international aid and mutual aid cooperation (CIFFC, 2015)6. In Manitoba, northwesterly winds blanketed large regions of the province with thick smoke, reducing visibility and air quality. This reduction in air quality placed residents, particularly children, seniors, pregnant women, and people with heart or lung conditions, at increased risk of health issues from breathing in smoky air. In 2016, a major wildland fire impacted Fort McMurray and surrounding communities, evacuating 88,000 people and burning 2,400 buildings. This event was Canada's fourth largest fire on record, and became the most expensive natural disaster in Canadian history (NRC, 2017)7. 2017 brought moderate drought conditions to Manitoba after an early spring freshet resulted in above normal streamflow conditions across most of southern and northern Manitoba. However, after months of below average precipitation during the growing season, by July and into August almost all of Manitoba was experiencing moderate to severe precipitation conditions. Due to warm temperatures, dry conditions and high winds, August brought a significant increase in wildfire activity relative to previous months, resulting in serval fires causing the evacuation of thousands of residents from numerous northern communities. Although the drought conditions experienced over the 2017 growing season generally did not have an unfavourable impact to crop yields, there was a reduction in pasture productivity and concerns about on-farm water supplies going into the winter season. Canadian wildfires produce river of smoke, June 29th, 2015. Tree ring analysis provides insight about the climate on the prairies prior to human observations started in the early 19th century. Tree rings research provides data that demonstrate the occurrence of wet and dry cycles in prairie rivers for the last 1000 years. A clear multidecadal cycle between wet and dry cycles exists. Tree rings in the Upper Assiniboine River Watershed provide evidence that the most severe drought on record occurred in the latter half of the 16th century. This drought appears more severe, and much longer, than the drought of the 1930s. Tree rings form the Red River Basin show that the Red River was also in a severe multi-decade drought in the mid- to late-1500s. It is difficult to comprehend the catastrophe that would occur if Manitoba and the rest of the Canadian Prairies were to experience such a severe, multi-decade drought today. It would be the greatest natural disaster the Canadian Prairies has ever experienced. The history of drought in Manitoba and the rest of the Canadian Prairies demonstrates that the impacts of drought can be extreme and can have consequences from a local to national scale. The historical cycle of wet and dry periods assures that the return of severe drought to Manitoba and the Canadian Prairies is inevitable in the coming decades. Severe multiyear droughts have occurred frequently in each century for the last number of centuries. The droughts throughout the 20th century have proved that increased capacity (preparedness) through a variety of methods can help reduce the impacts of drought. The best way to protect Manitoba from the harsh impacts of drought is to prepare as best as possible before severe drought occurs. Manitoba Drought Management Strategy will enhance Manitoba's understanding of drought and as action items are implemented, increase Manitoba's resilience to drought. Have you seen drought impacts on your area? Let us know! Please send us an email at drought@gov.mb.ca. Don't forget to include pictures! Being prepared for the onset of drought is the most desirable and proactive means to manage drought. One of the action items in the Manitoba Drought Management Strategy is to conduct drought preparedness assessments at the sub-basin scale to evaluate how prepared various sectors (eg. water supply, agriculture, the environment, the economy, community health, etc.) are for future droughts. Conducting these assessments allows government and stakeholders to inventory and understand past drought impacts, current vulnerabilities, and make preparations to mitigate future impacts. Over the next five to ten years, drought preparedness will be assessed for sub-basins across Manitoba. A promising mechanism to collect the required information to assess drought preparedness is the consideration of drought within the integrated watershed management planning process. Integrated watershed management planning is a collaborative effort between government, watershed residents and stakeholders in which a long-term plan is created to manage water, land and other resources for a particular watershed. The culmination of each drought preparedness assessment is a suggestion of sector-specific preparedness levels (none, low, medium and high) for each sub-basin. In the future, these preparedness levels alongside real-time drought indicator information will be used to operationally monitor drought stage across Manitoba and determine the required response at various levels of government. As drought preparedness assessments are completed, they will become publically available on this webpage.